"Hersey Girls, Parents Weekend, Westbrook College, 1977"
Westbrook College students from Hersey Hall sit on the floor of Wing Lounge with a group of parents and students seated behind them in this candid black and white photograph from the 1977 Parents Weekend. 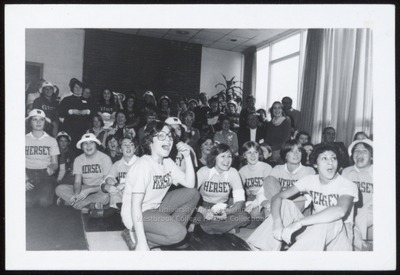 The ten Hersey girls wear light colored t-shirts with Hersey printed across the front in large letters. All wear jeans; some wear white camper hats with a "W" on the front. Laughing and shouting, everyone seems to be reacting positively to a performer or speaker who stands just outside the camera range but within sight of this receptive parents weekend audience.